The practice of celebrating the nation’s independence with a lakeside picnic grew from a nineteenth-century belief in the purifying quality of nature. It was temperance advocates who originally pushed Fourth of July celebrations away from towns, and it is that cultural work which sheds light on the relationship between nationalism and nature in the period. In towns, parades on this day turned rowdy quickly. As historians of the holiday have shown, in the early nineteenth-century trade unions and other groups competed to display their patriotism largely by being the most festive, a practice that demanded heavy drinking, it seemed. Not all Americans, however, wished to demonstrate their patriotism in that way, yet they needed to show it somehow. As the photograph below from South Carolina in 1939 suggests, many established a tradition of turning to nature. 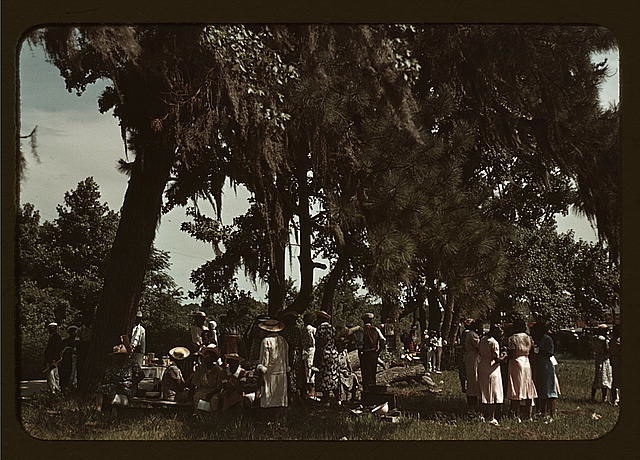 In this photograph, African-American residents of St. Helena Island perform a number of cultural identities: they are reunited as family members and patriots; they are dressed to highlight their dignity even as they live within a culture that denies it; and they are also comfortable, perhaps even at home, in this grove. This swirl of associations was by then a century old, dating back to the temperance crusaders who took these celebrations out of the town and into the countryside. Before the sublime landscapes of the American West became the iconic symbols of American nature in the late nineteenth century, the picturesque tradition filled that role. Although largely forgotten today, the temperance advocates helped marry patriotism to picturesque aesthetics. In orations given at lakesides and groves, they encouraged Americans to live cleaner and healthier lives. Such speakers often focused on individual choice as the avenue to better living, a rhetorical tactic shared by camp meeting preachers in the same era. Indeed, these Fourth of July celebrations strongly overlapped in form with camp revivals, especially in their choice of location within picturesque nature. As camp meetings and revivals waned in American culture during the nineteenth century, Independence Day picnics carried the form forward. But these spaces changed, too. Groves especially became less central to the intimate geography of small-town or rural life by the turn of the century. Lakeside celebrations became more common, and those spaces were far from the pure nature once thought to sustain the soul. Instead, they were often reservoirs and state parks, places born by the industrialized agricultural landscape. This chapter examines the landscape history of the holiday, including the symbolic play at hand in this tradition.